This product requires the base game Fairy Fencer F ADF Deluxe Pack. 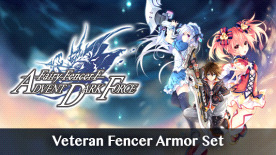 Protect ya neck with the Veteran Fencer Armor Set! ©2017 IDEA FACTORY / COMPILE HEART All rights reserved. Fairy Fencer F is a trademark of IDEA FACTORY. Licensed to and published by Idea Factory International, Inc. Please note: This content requires the base game Fairy Fencer F Advent Dark Force in order to play.